Ensures the accuracy of the IOL’s insertion during injection. 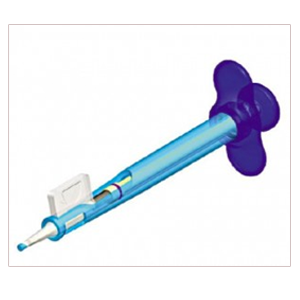 Uses a hydraulic effect of the viscoelastic solution to drive the IOL with the silicone stopper through the entire cartridge in one uniform fluid motion. The hydraulic pressure guarantees smooth, precise and completely controlled movement of the IOL through the cartridge. This enables the surgeon to direct the IOL injection via a micro-incision of only 2.0 – 2.6mm; with increased surgical control and lower complication rates, which in turn, result in superior patient comfort and speedier recovery. EtO sterilized and blister packed.